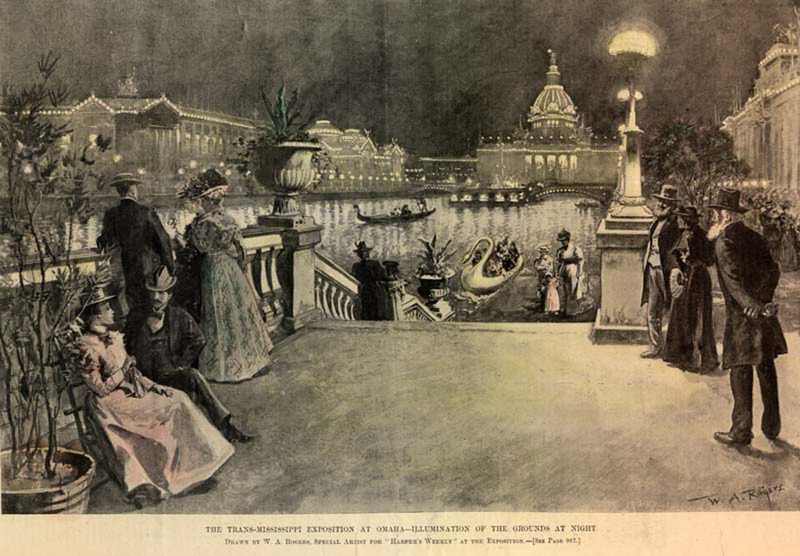 Caption: The Trans-Mississippi Exposition at Omaha--Illumination of the Grounds at Night. Drawn by W. A. Rogers, Special Artist for "Harper's Weekly" at the Exposition 1898. Size: 18 1/2 x 14 1/2 in. Harpers Weekly; Trans-Mississippi grounds. Grand Court at Night, looking west. Liberal and Fine Arts Buildings to the southwest. U.S. Government Building to the west, and Manufactures' building to the north. Light crowd at top of step leading to lagoon. Gondolas and swan boat in lagoon. Framed Print.